The 24-Button black IP telephones (1100161) come equipped with 9 fixed feature keys, energy saving sleep mode, built-in wall mounting, and innovative two position angle adjustment. The NEC SL1100 Package (24 IP Phones) has many exciting features for users of all types. 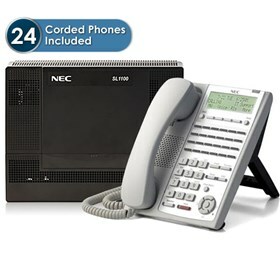 The NEC SL1100 Package (24 IP Phones) is sold as a Brand New Unopened Item.